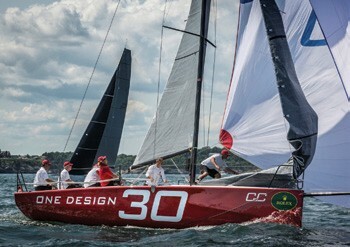 The ninth biennial New York Yacht Club Race Week at Newport presented by Rolex comprised two parts, with racing on Narragansett Bay and Rhode Island Sound. 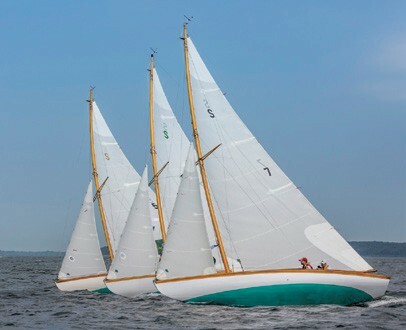 Part I, “Classics Weekend,” was sailed on July 12 & 13 with racing for spinnaker and non-spinnaker classic yachts, Herreshoff S Class, and 12 Metres. Part II, for One-Design and Handicap classes, was held July 16-19, with 73 teams competing in Swan 42, J/109, J/44 and Marstrom 32 one-design classes, three IRC divisions and one PHRF division. 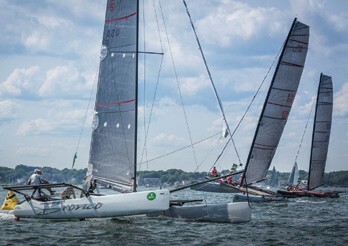 Part II of regatta served as the Swan 42 National Championship and the J/109 North American Championship. Twenty-seven boats sailed in IRC (with 10 of those dual-scored for HPR). In addition to Vesper’s victory, Heidi & Steve Benjamin’s Carkeek 40 SPOOKIE (Norwalk, CT) won IRC 2, while Ed Freitag & Molly Haley’s Summit 40 DownTime (Annapolis, MD) prevailed in IRC 3. In the 8-boat PHRF division, Maryellen & Dave Tortorello’s J/111 Partnership (Bridgeport, CT) notched five bullets in eight races for the victory. In the 5-boat J/44 class, Bill Ketcham’s Maxine (Greenwich, CT) won a tiebreaker with Jim Bishop’s Gold Digger (Jamestown, RI). Organizers implemented new concepts never tried before at Race Week or, for that matter, at any other traditional regatta in Newport. Most popular was the stadium-style racing on Thursday and Friday, with the windward-leeward laps of the keelboats viewable from the shorelines of Jamestown and Newport, while the swift Marstrom 32 catamarans raced on America’s Cup-style courses.